And so maNavALa mAmunigaL wishes to divine in a big way using five pAsurams about this AzhvAr’s greatness. Oh my mind you who without knowing the difference between the star days mentioned earlier and this star day, and who is fond of those other star days! If so, if you asked what is the excellence of today, then hear what I say as I know its excellence very well. nanRi punai etc. 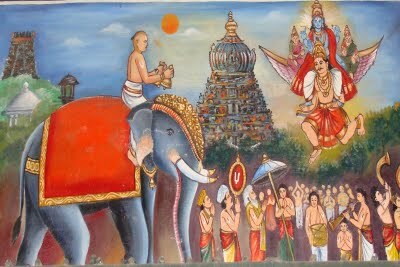 – That is, alas, the subject who is always wished well by the ever active nithyasUris who fear for emperumAn’s safety (even) in the place where time is immaterial (SrI vaikuNtam), has divined his appearance here with his soft beautiful auspicious divine body (dhivya mangaLa thirumEni), as target of the eyes, in this place where kali (yuga) is ruling and where there are offending enemies – so becoming very sad, AzhvAr took the bells from the elephant’s back (as he was sitting on it as arranged by the king for proving the superiority of SrIman nArAyaNan as the one and only one to go to, to escape from this material world), and setting the tune he sang thiruppallANdu to add glory to emperumAn – such bhatta nAthar (head of the learned) who is our head incarnated such that the Ani (vaiSAka) month’s svAthi star gained the greatness that is not present for any other (star days). So, learn the greatness of this day which is wonderful in every which way, and become fond of it. nanRi punai – (nanRi -> goodness) (punai -> put/tie together); Goodness put together in his pallANdu. Goodness put together on emperumAn by his pallANdu. 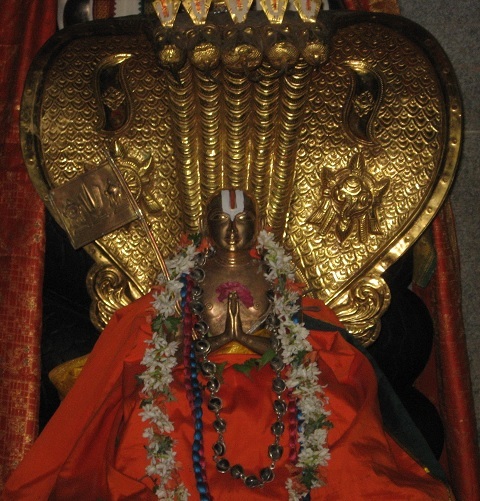 It is to be said, ‘thAn mangaLam AdhalAl [upadhEsa raththina mAlai – 19] (auspicious (thiruppallANdu)), and ‘pallANdu enRu kAppu idum [rAmAnusa nURRanthAdhi – 15] ((periyAzhvAr who puts together protection (mangaLASAsanam) to emperumAn through pallANdu). pattar pirAn – (head of the learned) – by this it has talked about the way he established the supremacy of emperumAn and destroyed placement of that in others. pallANdu pAdiya – by this it has talked about the way of his care for the divine beautiful body of emperumAn. 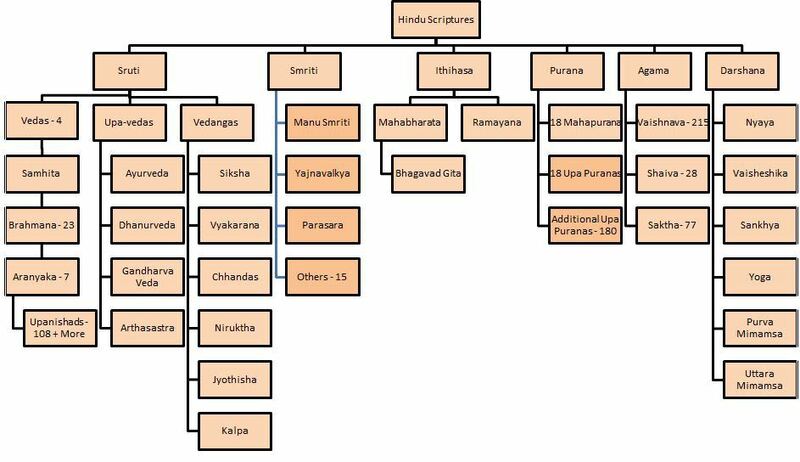 By this, it is clear that Isvaran’s (one who controls) svarUpam (nature) etc., are under the control of this AzhvAr. This entry was posted in Other, upadhESa raththina mAlai and tagged 74, ani, annan, azhvar, erumbi, erumbiappa, ezhai, kovil, mamunigal, manavala, nenje, pallAndu, pasurams, pattar, periyAzhvAr, perumai, piran, rathina, rathinamalai, raththina, raththinamalai, sodhi, upadesa, upadhesa on December 18, 2015 by raghuram. vAzhi – shall live forever. In the previous pAsuram after getting convinced that the insult of those Others is a praise only, as he continued on divining the prabandham, for the badness that might come from the adversaries to be removed, he who is agreeable performs mangaLAsAsanam to those related to dhivya prabandhams, and for the prabandhams created by them, starting with ‘AzhvArgaL vAzhi’. This pAsuram serves as a summary of the pAsurams that follow in this prabandham. That is, about the glories of AzhvArs, the glories of aruLichcheyal (prabandhams), the glories of those who spread about them/these, that is, the AchAryas, and the glories of the vyAkyAnams divined by those AchAryas, are what this prabandham (upadhEsa raththinamAlai) shows us. So this pAsuram can be considered as ‘uLLathukkellAm churukkAi [upadhEsa raththina mAlai 19]’, that is, it can be said that the summary of this prabandham is this pAsuram. 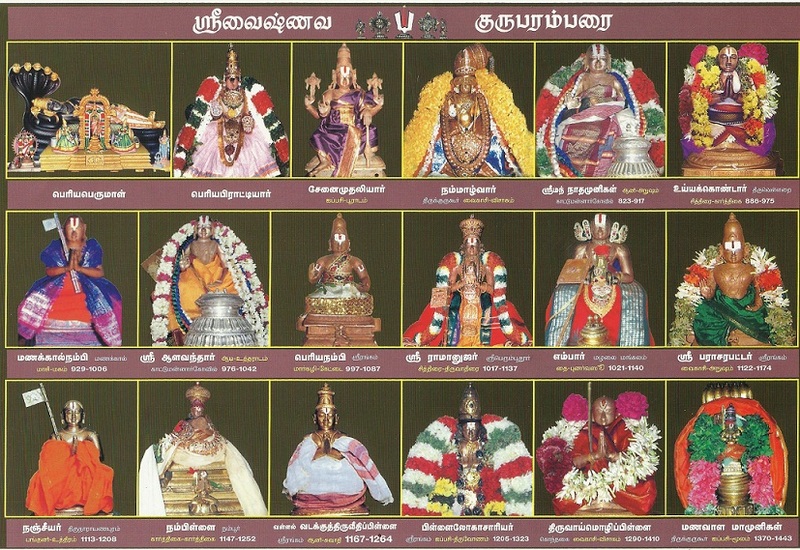 AzhvArgaL vAzhi – they are – after getting ‘mayarvaRa madhi nalam [thiruvAimozhi 1.1.1]’, they are being ‘theruLuRRa AzhvArgaL [upadhEsa raththina mAlai 36]’, (AzhvArs having divine knowledge), that is nammAzhvar, thirumangai AzhvAr et al. For such noble ones, he is doing mangaLAsAsanam to avoid the touch of blemishes of the birth, and for them to live well forever; singing pallANdu to the ones who are earnest in singing pallANdu, is the work of mahAmunis; he is too maNavALamAmuni. ‘vAzhi satakOpan, vAzhi parakAlan [iyal sARRu]’ is how those who love these AzhvArs would say. aruLichcheyal vAzhi – aruLichcheyal are – by the grace of sarvEsavaran to them, they showed grace/mercy and divined the ones that can be the identity for the four vEdhas and their angams (subs); that is thiruvAimozhi and other prabandhams. He is doing mangaLAsAsanam that these distinguished prabandhams should continue in vogue forever without having shortcomings of place, time, or author. Would say, ‘vAzhi satakOpan ittath thamizhp pAvisai [iyal sARRu]’ (lovely thamizh pAsuram of satakOpan shall live forever), and ‘vAzhi parakAlan eNNil thamizhp pAvisai [iyal sARRu]’. seeing such AchArya’s vaibhavam, mAmunigaL understanding their greatness is the person doing mangaLAsAsanam to them, like ‘indaLaththilE thAmarai pUththAr pole indha vibhUthiyil ivargaL silarE’ (like a lotus blossoming in an incense stand (hot/dry? ), in a world like this, these (AchAryas) have incarnated!). ‘vAzhi ethirAsan [Arththi prabandham – 1]’, and ‘vAzhi ulagAsiriyan [mumukshuppadi thaniyan]’ (piLLai lOkAchAryar shall live forever), are the ways of maNavALa mAmunigaL’s words. Ezh pArum uyya avargaL uraiththavaigaL thAm vAzhi – that is, the AchAryAs’ vyAkyAnams are such that they would help the people of this world of seven parts surrounded on both sides by water, to reach the goal; as said in ‘ulagu uyya umbargaLum kEttuyya [iyal sARRu], their vyAkyAnam helps all the worlds. seyya maRai thannudanE sErndhu – dhEvareers (all your highness) who are well versed in all the sAsthram, created the vyAkyAnams whose greatness is such that all its meanings are given based on the sAsthram. Or, the noble meanings of your vyAkyAnams are such that the sAsthras could follow it too – as said in ‘vidhayachcha vaidhikA: sthvadheeya kambheera manOnusAriNa: [sthOthra rathnam – 20]’ (even the commands of vEdhas are of the nature of following the deep/profound intellect of your devotees). ‘seyya mArai thannudanE sErndhu avargaL uraiththavaigaL thAm vAzhi’ (along with the virtuous vEdhas, what the AchAryas have spoken (vyAkyAnams) shall live forever) is the way of blessing them when seeing their greatness. seyya maRai – vEdham shows its meanings to the righteous, and hides to the others; after joining the vyAkyAnams of dhivya prabandhams, the vEdhas have become virtuous. That is, ‘alpa shruthar kalakkina shruthi nan gnyAnaththuRai sErndhu, theLivuRRu, Azh poruLai aRiviththadhu [AchArya hrudhayam – 71], by the pristine meanings provided by AchAryas is how one could see the deep/true meanings of vEdhas. Thus he performed mangaLAsAsanam that the blemishes of kali yuga should not touch those (AchAryas) who understand and follow the distinguished references (pramANams), and should live forever, without any blemishes, etc. It is said, ‘pramANancha pramEyancha pramAthAachcha sAthvikA: | jayanthu kshapithArishtam saha sarvathra sarvadhA [srIbhAshya srutha prakAsikA thaniyan – 8]’ (the one that is the reason for true knowledge (reference/pramANam), and what is identified by pramANam (emperumAn), and those who get the knowledge through the pramANam (preceptors/AchAryas) – let the inauspicious aspects be destroyed, and victory to them together, at all places and at all times). This entry was posted in Other, upadhESa raththina mAlai and tagged 74, annan, erumbi, erumbiappa, kovil, mamunigal, manavala, mangaLAsAsanam, pallAndu, pasurams, rathina, rathinamalai, raththina, raththinamalai, upadesa, upadhesa on December 4, 2015 by raghuram.